GitHub - cuducos/MeDontLikeFB: Make your Facebook better, stop liking things. Make your Facebook better, stop liking things. Want to be notified of new releases in cuducos/MeDontLikeFB? 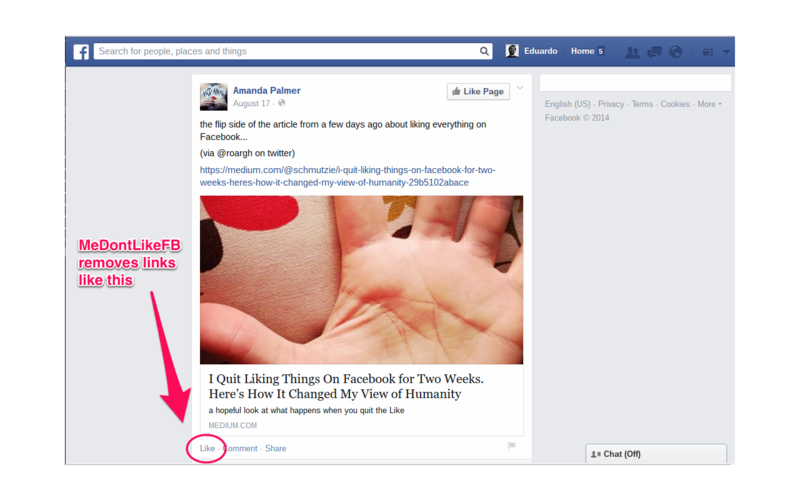 This is a Chrome Extension to remove Facebook “Like” links for posts, comments etc. The idea is based on Elan Morgan’s experiment. You can install Me Don't Like Facebook from Chrome Web Store. Basically what does the job is the code in init.coffee - a few lines of CoffeeScript which are compiled and minified into init.min.js. Licensed by Eduardo Cuducos under the MIT license.